Parathas are a favourite among many and it is made in many ways like aloo paratha, methi paratha, peas paratha and so on. 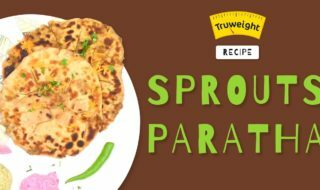 This paratha recipe made with sprouts is a delicious dish filled with nutrients making it a wholesome meal. A ready to eat food which can be packed for lunch or it can be had as an evening snack. Without much thinking, try out the recipe and I bet you will like the recipe. Mix hi-protein atta, curd, salt, water and mix it to make a dough. In another bowl add the mixed sprouts, green chilies, coriander leaves, ginger garlic paste, and salt. mix it properly. Make small balls from the dough and roll it round. Add the sprouts and then roll it again. Fry it in less oil and serve hot.